I recently had the opportunity to work on a Ford Explorer. Evidentially the catalytic converter went bad and was gumming up the works. In an effort to get the Explorer to run again I modified some of the exhaust system. It is not my intent to leave the exhaust system in the modified condition. 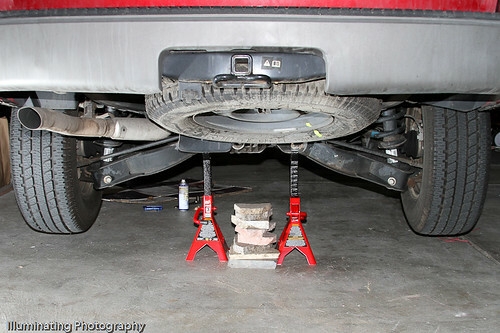 Because the car is an SUV I had to get creative about getting under it and to the parts that needed fixing. The blocks of stone between the jack stands were my creativity. I needed to get the truck higher than the jack alone would let me so it was a stepped process. Jack it up as high as the jack would go, raise the jack stands, release the jack, place blocks under the jack and repeat. I would not recommend this but it works in a pinch. Nest I needed to access the rear catalytic converter. When I put the below section back together I found out there is an exhaust gasket that needs to accompany the connection. Oops. One of the muffler hangers can also be seen above the exhaust pipes. Once I had the parts where I could move them and see inside it was time to get to work. 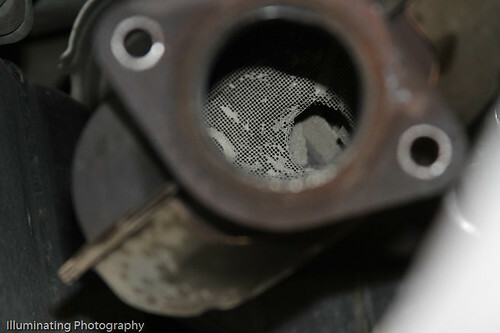 Above you can see the honey comb catalytic converter with the “modification hole” as well as some converter behind that. Once it was all put back together the car ran “well” again. 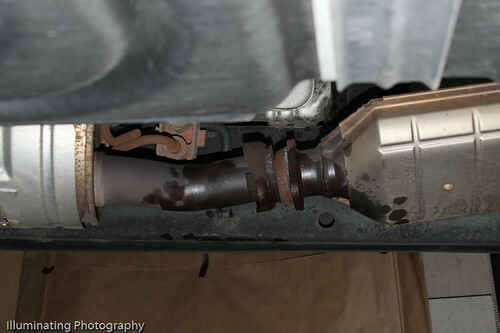 The purpose of this exercise was to see if the problem was indeed the catalytic converter and it appears that it was. Off to repair the rest of the car. I am Riccardo Celva, your italian cousin. I would like to send you a picture of your second aunts and myself. Can I have your e-mail adresse? Thank you.